The annual K-pop camp is returning in May with exciting activities and awesome visits in Seoul! 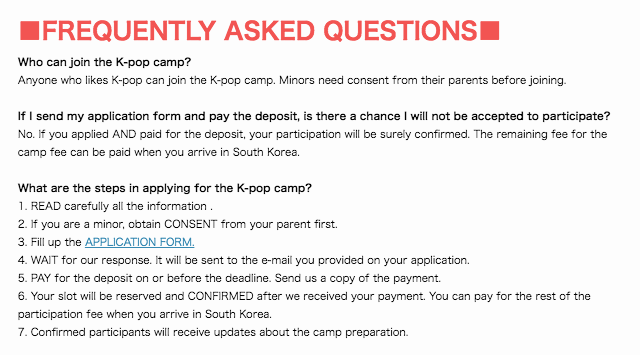 This is the 8th K-pop camp organised by Asia Hope Camp Organisation. Unlike other K-pop Camp, this camp includes the joint audition which means fans who participated in this camp has the opportunity to audition in Korea entertainment companies such as TS Entertainment, KIWI Media Group, TOP Media etc..
Main Activities: K-pop dance lesson, Vocal lesson, Seoul City tour, SMTOWM COEX visit, Korean Arts High School visit, NANTA performance tour and etc.. If you are one of the K-pop dreamers, don't miss this opportunity.